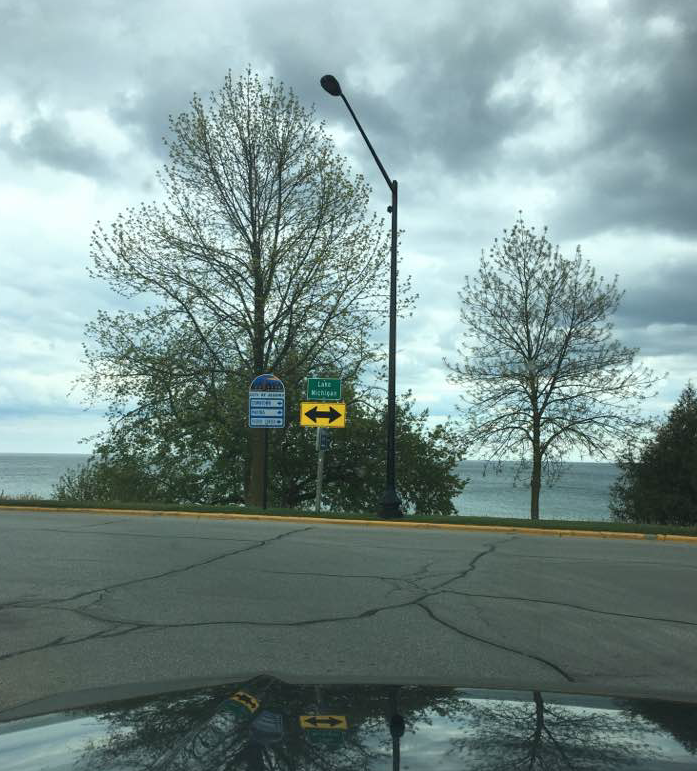 A while back I drove east from Mankato for six hours, stopped at Lake Michigan turned left and ended up in Algoma at the James May Gallery. I had been invited to be part of an exhibition titled, The Art of Water. It was an ambitious effort by the two owners of the gallery, Kendra Bulgrin and Jimmy Eddings, as they were coordinating the display of over fifty different artists in multiple venues around Algoma’s downtown. The vibe opening night was all about the community as the gallery opened its doors to a flood of art lovers loving water. Algoma is a town at the entrance to the famed vacationland of Wisconsin, Door County. Growing up in Illinois and spending my summers over on the Western side of Wisconsin I had never been to Door County. My mad dash and left turn was the first time I had been there. Algoma’s downtown has a Midwestern understated elegance that I’ve come to appreciate. The kind that hints at former prosperity and then loss. The Mason Lodge Hall dominates with typically decrepit silence. There are old stores, a few antique shops and a couple amazing restaurants in particular Scaliwags and a fantastic hamburger joint. Wilbur and I took the backroads across Wisconsin on our way to the opening. I love back road Wisconsin. Lots of meandering curves, hills dotted with cows and strange little towns. There’s a European feel to a lot of them. I always fantasize that I'm driving in Southern France. We stopped at some cool little coffee shops, checked out some lunch spots and had a nice slow roaming day in our car. So many small towns in the Midwest are looking to “the arts” to save them. It’s kind of odd. That idea that arts will save a crumbling downtown. What I think will save downtowns, what will save communities, are the things we do to bring us together. Things that we do that create dialogue. Things that we do that fill our souls and fills our spirit with air and lightness. That’s what art does, it fills us with light. Art will save us from ourselves because art is not about us. Art is about asking questions, it is not giving an answer, it is about twirling a poem around your finger snapping it out into the night sky shaking the stars, sparks rising, wind blowing cold from the north. Art must challenge. Art must challenge. Art must challenge. I needed to repeat that three times. I live in a smallish town that is using art to revitalize itself. When people ask me about this I always say “Art is subversive”. Art is not an acknowledgement of the status quo, it is something that digs down to question the status quo. Nothing else does this. Art is a subversive gesture. It asks really simple questions like, “who are you?” or “are you who you think you are?” or “is the color yellow really the color yellow?” or “Why do you hate?” or, “Is this circle the sun?” or "Why is love everywhere?" Nothing else does this. Nothing. The James May Gallery is a spunky gallery in the middle of a little town on the shore of the magnificent Lake Michigan or Lake Mishigami. It’s a body of water that dangles down into the Midwest like a watery negative Florida shape. Chicago, Green Bay, Gary, Milwaukee perch on its shoreline. All old industrial cities, rusted artifacts. The foundries and factories are gone just lightness and grace. How do they cope? Partially through art and it is happening in both cities and rural outposts like Algoma. I admire people like Kendra and Jimmy that are working hard to create a place of energy, beauty and heart. I'm in an exhibition with two other artists, Jimmy Eddings, who creates gorgeous ceramic work and Clare Doveton, who creates beautiful ethereal landscapes. I am honored to be included with these two artists.